Although it has been over a decade, it seems like only yesterday when I was bitten by the bug — the Acropora bug that is! I remember flipping through the pages of books such as Carden Wallace’s Staghorn Corals of the World, and Charles Veron’s Corals of the World Volume 1, hoping to one day obtain a piece of the elusive Acropora echinata, as well as numerous other species you just didn’t see available several years ago, fueling this passion (disease) into today. Unfortunately, I have yet to find a cure for this illness contracted from the bite, and to be honest, I don’t really want to be cured. 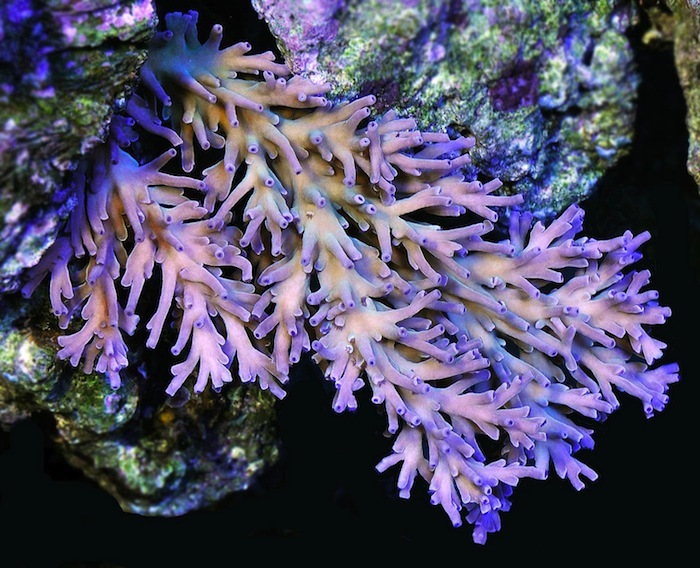 Avid reef enthusiasts like myself constantly strive to collect unique color morphs or unusual species of Acropora that are not often encountered in the aquarium trade . This collecting can be very addictive, consuming an immense amount of one’s time and money along the way. The journey of learning about and tending to an aquarium full of colored sticks (as some without the illness may call it) is more than exciting. With some knowledge of husbandry, lighting, water flow and water chemistry, along with a little creativity, hard work and diligence, the vision of creating the ultimate home display of large grown-out colonies of different Acropora species is within reach for all of us who share the same passion. The one problem, it seems, is that the journey never really ends as there is always just one more species or color morph I need to find! 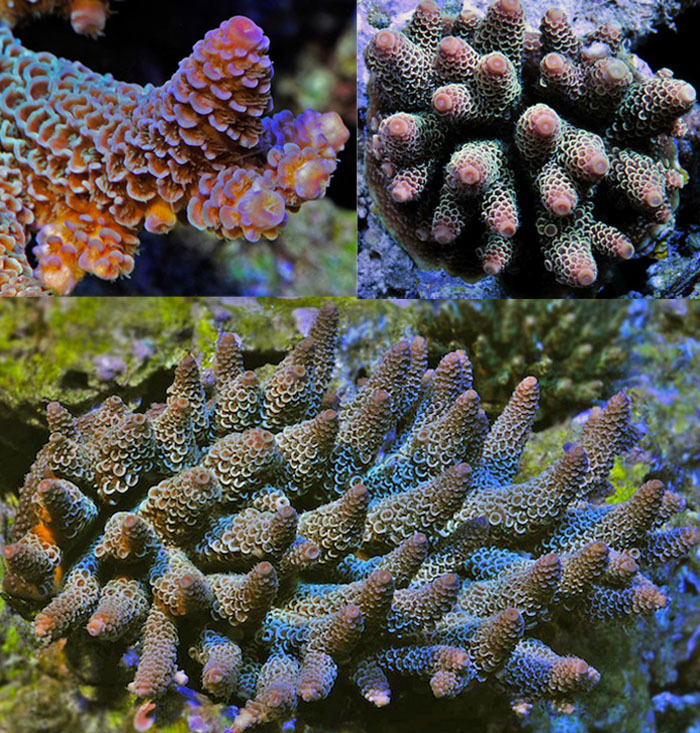 The last few years have been incredibly exciting for hard-core Acropora enthusiasts, as we have seen a dramatic increase in the diversity of species to select from for our prized displays. 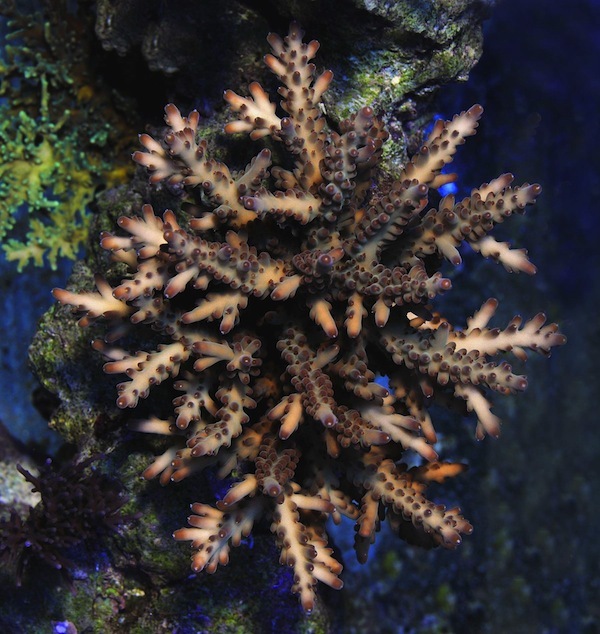 There has never been a better time to find some species that have eluded us in years past, as the supply of incredibly-colored Acropora is more prevalent than ever. The opportunity to find species available in the trade that we used to only dream about is now a reality, due in part to the relatively recent availability of stony corals harvested and exported from Australia. 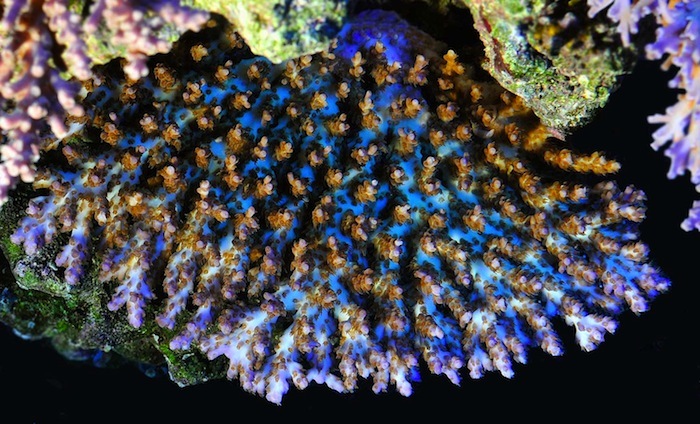 Although these corals are much more expensive than their Indo-Pacific and South Pacific counterparts, a handful of Australian exporters are supplying some of the most colorful, unusual, and even hardy species which are sure to appease even the most seasoned Acropora enthusiast’s tastes. Statistically, the major exporting country for stony corals for the marine aquarium trade is Indonesia. Although there are numerous desirable species, which include most of the “deepwater” or smooth branched endemics from this region, unfortunately most of the wild-harvested Acropora species change hands numerous times prior to being ready for export. Scenarios such as this can lead to improper post-harvest handling and holding, as it’s not uncommon at all for most of these stony corals to reside in less than ideal conditions for days or weeks at a time, oftentimes being subjected to very low or even no light for days at a time. For this reason, wild-harvested Indonesian Acropora corals exported from Bali and Jakarta can be much more temperamental, oftentimes arriving to the importers in very poor condition, which makes their successful transition and adaptation to a modern day closed system very challenging. Acropora species from other exporting countries in the South Pacific can fare much better, as the supply chain is much shorter and more direct, with minimal time out of the wild habitat before they are exported around the world. These countries include the Solomon Islands, Tonga, and Fiji. However, transit times and packing can have an impact on how well these species fare from the South Pacific countries. There is little diversity in Acropora species collected and exported from the Solomons, with only a handful of wild-harvested species being targeted and collected for the aquarium trade. 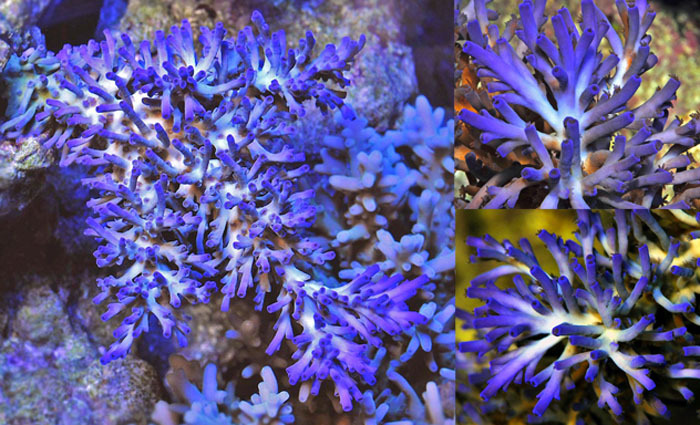 Solomon Islands stony corals are exported from only one collection station in this region, and coral shipments primarily consist of Zoanthus spp. rock, soft corals, and larger polyped stony corals. The main reason for such a limited species diversity of wild harvested Acropora spp., in my opinion, can be directly attributed to lengthy transit times, as it’s not uncommon for fish and corals to be in transit for up to 40 hours. This can be very stressful for more sensitive stony corals such as Acropora. Unusual Bali deepwater plating Acropora colony that resembles A.speciosa (Wallace C.- Staghorn Corals of the World), and A. Caroliniana (Veron J.E.N.- Corals of the World) that appears to have grown in low light and protected area sheltered from strong current. Tonga is another South Pacific country which exports some very nice Acropora corals from only a few export stations, so there is limited pressure on the reef. When the corals are packaged correctly for transit and arrive to the importers in a timely manner, they generally ship well. Although the species diversity that is normally exported from this region is not as broad as Fijian Acropora, wild-harvested Tongan Acros can transition very well to home aquaria if handled and acclimated properly. Fiji is another South Pacific country which exports Acropora corals, coming primarily from three export stations. 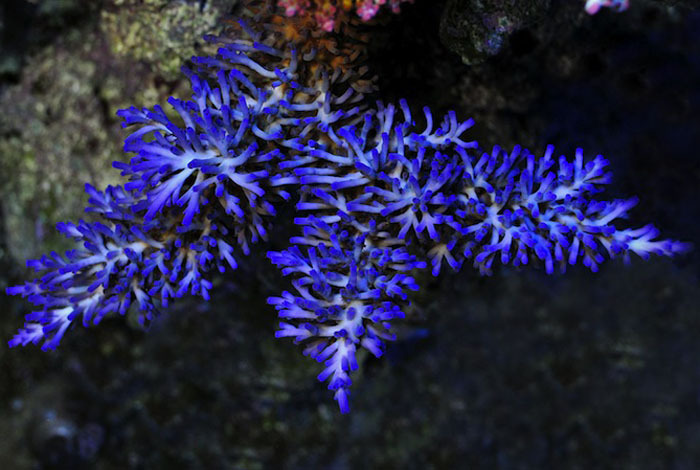 Having handled Fijian Acropora corals from one export station on a weekly basis for several years now, I can say first hand that this is one of the best source countries for procuring healthy, colorful, and even hardy Acropora species. In early 2005, I was fortunate enough to make the trip to Fiji, and dove for 10 days with one of the export station’s owners, Tony Nahacky. Each day consisted of two to three dives harvesting corals in different locations and habitats which helped provide a much better understanding of what it takes to get these corals to the marketplace here in the United States. It was refreshing to see the diversity of coral species in the specific collection areas that are utilized to harvest stony corals for the aquarium trade. The collection takes place primarily on outer reef habitats that are prone to natural degradation from storm damage and rough seas. The harvested corals consist of smaller, young colonies that are about the size of one’s fist. The corals harvested during each expedition were transported back to a modern holding facility within hours of collection as opposed to upwards of a few days when compared to countries like Indonesia. Once in the holding aquaria and under proper lighting, the corals are then cleaned and allowed to recover prior to being packaged for export. Direct flights from Fiji to the United States keep transit times to a minimum; this short supply chain is very beneficial to more sensitive corals such as Acropora, making Fijian stony corals some of the best in the world. 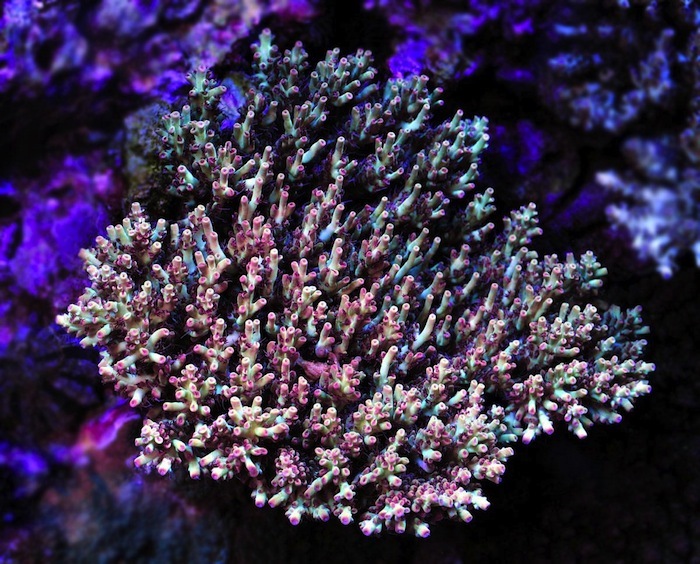 Fijian Acropora corals can adapt very well to home aquaria and are some of the hardiest and most colorful wild-harvested Acropora species when they are handled and shipped correctly. The latest player to hit the scenes, offering up some incredibly colored and desirable stony coral species is Australia. The Australian fishery is very sophisticated and well managed, with some incredibly diverse Acropora species, some of which are unlike anything we have ever seen firsthand. 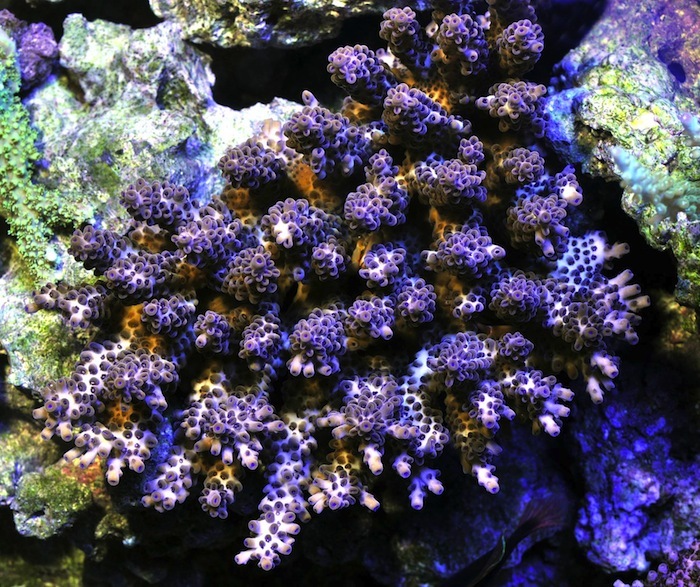 The old adage of ‘you have to pay to play’ is so true for these corals – but for good reason. The expensive price tag is dictated by numerous factors, all of which influence the cost of these animals. Some Australian export stations are considered by many as the best in the world, with very modern facilities run by experienced personnel, so the overhead in itself is generally much more expensive when compared to other source countries. Collection areas can sometimes be quite far away from the facilities, so larger vessels powered by thirsty engines can burn up large quantities of fuel, which is very costly. Add to this the utilization of modern dive equipment by trained, experienced and knowledgeable divers, who are themselves paid a good wage, and the expenses keep piling up. 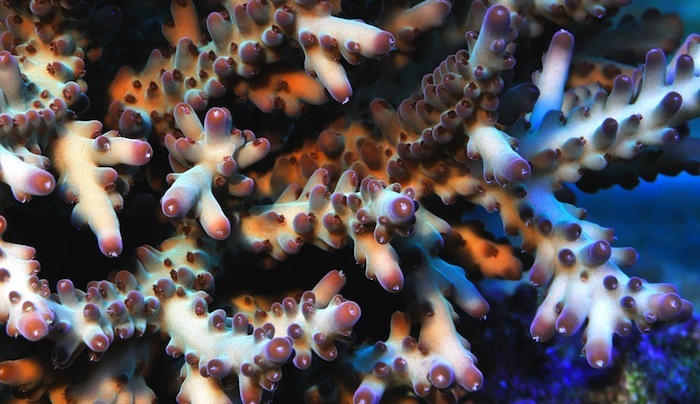 Licensing fees, international freight costs, importation and clearance fees are but a few more examples of the expenses that influence the steep price of some Australian Acropora Corals. However, some of the most unusual and incredibly colored species are currently being exported the likes of which we have never seen before–appeasing even the most seasoned Acropora aficionado! Indonesian rare Acropora Walindii, Fijian Acropora cerealis, Australian Acropora Subulata.